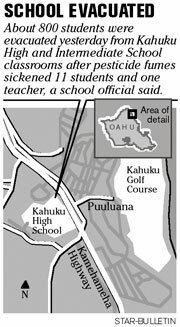 Seven students went to the hospital yesterday because of fumes reportedly from a pesticide at Kahuku High and Intermediate School. Paramedics took three girls and one boy, between ages 12 and 16, to Kahuku Hospital with eye, ear and nose irritation, said Bryan Cheplic, spokesman for Honolulu Emergency Medical Services. Three more students went on their own, a nurse confirmed, and all seven were released after treatment. Greg Knudsen, Department of Education spokesman, said 11 students and one teacher were sickened by fumes from the pesticide Orthene, which came from a nearby sod farm. School officials evacuated 800 to 900 students from two main buildings and portable classrooms on the school's upper campus to the front lawn at about 1:20 p.m., Knudsen said. They remained there until the end of school after 2 p.m., he said. Leslie Au, a toxicologist at the state Department of Health, said the active ingredient in Orthene, acephate, is not highly toxic. The pesticide is easily available and known for producing short-term side effects, such as tearing, runny nose and nausea, following high doses of exposure. Fresh air helps, and there are no lingering or delayed reactions, he said. There appeared to be some contradiction yesterday as to the source of the trouble. Firefighters arrived at the school at about 1:20 p.m. and could find no evidence of pesticide fumes, said Honolulu Fire Department spokesman Capt. Terry Seelig. "Everything indicated there wasn't a release of a pesticide at that time," he said. The nearby sod farm, called Ameri-Turf, did not use Orthene yesterday. Manager Andrew Gon said he was preparing to spray the turf with the grub-killing pesticide when police told him what happened. "I think I would have caused more havoc if I did (spray)," he said, adding that he would wait to spray when there are no children at the school.